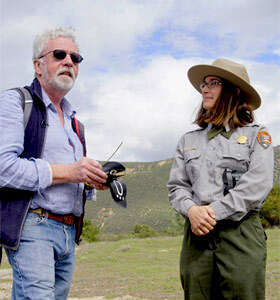 Paul Howey discusses the evolution of MTI's patagial PTTs with Alacia Welch of the National Park Service. When King Laughlin and his colleagues from the National Park Foundation visited our office last summer, they came with a very specific message, part of which we already understood quite well: California condors, the nation’s largest bird, needed continued conservation work. Considering that the species dwindled to a genetic pool of only 22 individuals in the 1980s (primarily due to poisoning from hunters’ lead shot in carrion), and a breeding pair typically raises a clutch of only one chick, it is understandable that it has required many years of captive breeding and strategic assistance to help the population climb to roughly 450 in the US. In fact, Microwave Telemetry has been a part of this cooperative effort since the beginning — we designed the first patagial tags as a request from condor researchers in the early 1990s as a way to monitor captive birds after they were first released into the wild. The second part of their message was a surprise to us; when the National Park Service conducted a study last year to assess the scientific projects within national parks with regard to their respective community involvement and interest, the California condor restoration project (which includes policy design, mortality assessment, genetic diversity, overall health and wellness, etc.) ranked high on their list. Meaning, this work was not only preserving the condor, it was helping to preserve the National Parks. The MTI team with colleagues from the National Park Service, the National Park Foundation, and the Pinnacles National Park Foundation. Our company exists to support conservation and research, and our team takes pride in that. So when our friends at the National Park Foundation approached us to let us know that our PTTs are an integral part of one of their most cherished projects, it spurred an idea — we could support the project and build the vital link between the work we do in our facility and the work of our colleagues in the field, through a shared experience. It had been many years since we had a company retreat (the late Chris Howey had enthusiastically planned them in the past). 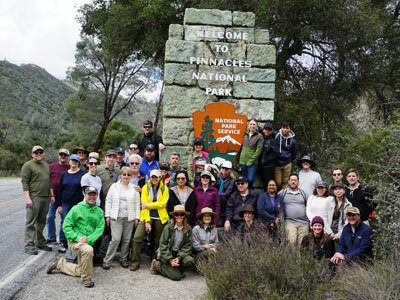 In early 2017, Bonnie Davis (a longtime MTI employee) and Lucy Howey began to plan a meaningful and mutually beneficial collaboration, working with Rachel Wolstenholme and Alacia Welch and their talented team at the National Park Service, Pinnacles National Park, and the park’s partnering organizations, the Pinnacles National Park Foundation, and of course, the National Park Foundation. The MTI team gladly took on the extra work to manufacture patagial GSM units and Argos/GPS PTTs for the biologists at Pinnacles and personally delivered the PTTs to California. The MTI team was also given a behind-the-scenes opportunity to watch from a staging area as the biologists deployed the tags on the highly endangered birds. It was truly a once in a lifetime experience that offered an authentic and new perspective for our team and a chance to recharge and engage with each other.